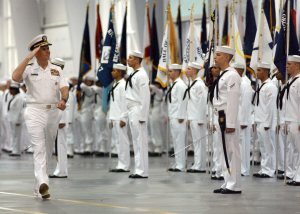 Welcome to your complete guide to graduations at Great Lakes Naval Station. This is an exciting time in the life of your sailor and we endeavor to provide you with the most comprehensive graduation information available for Great Lakes Naval Station. Graduation schedules and events are published below to aid you in scheduling your attendance at your sailor's graduation. You will find many cost effective options for traveling to Great Lakes Naval Station. You will be able to review the complete details on the many hotels available to meet your lodging needs. The greater Great Lakes Naval Station area provides many options for dining ranging from fast food to full service restaurants. Be sure to check out the information on the many attractions available for sight seeing. Access list: Recruits are permitted to place up to four names on the access list for graduation (children under 3 do not need to be on the access list). Only the recruit may submit or change names, and no changes are permitted once the access list has been submitted to RTC Security the week prior to graduation. Please be sure to write to your recruit to let them know who will be attending. Great Lakes Naval Station is located in Illinois adjacent to Waukegan, IL on the north of Chicago. Click here for more information on air, bus, and train transportation for Great Lakes Naval Station. Due to security measures that are implemented at Great Lakes Naval Station you may experience delays getting onto the base. Be sure to allow for extra time to make sure you arrive at the graduation event on time. During your recruit’s first week at Recruit Training Command (RTC), the Commanding Officer will send home an informational letter that contains very important information regarding graduation, including your recruit's graduation date, the names of their intended guests, and the password required for the gate pass. The gate pass is required only if you intend to bring your vehicle onto the base. Recruits are permitted to place up to four names on the access list. If the names in the packet are different than the guests attending, please write to your recruit immediately to let them know so they are sure which names to include on the list. They will put this list together before the final week of training and it cannot be changed once it is submitted to security, so please coordinate with your recruit as only recruits may place names on the list. RTC can neither change these names nor release the names of those on the list. What to wear to a graduation ceremony? 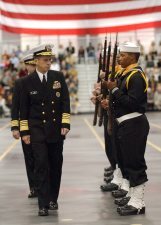 Your sailor will be dressed in a Navy Dress White or Blue uniform which is the Navy's formal uniform. You may wear want you want from casual to your Sunday's best. Liberty Policies vary by unit and depending upon the next destination of your sailor. Please see unit for details on liberty after graduation. Basic Training graduations from the Navy are conducted every Friday. For complete graduation details and schedule of events please click here.